Surprisingly pleasing to the Western ear, Japanesque offer a guided tour of the colourful and little-known Japanese repertoire of music and song. Japanese pieces range from the 18th century chamber classic Kurokami (Black Hair), to the well loved popular song China Night. Twentieth century Japanese compositions are also featured, showing the influence of Debussy, Ravel and other European composers. The clear, ringing chords of the Koto (Japanese harp) and the ethereal purity of the Shakuhachi (bamboo flute) will delight even the most jaded listener. Rié Yanagisawa (koto, shamisen, voice) wears full formal kimono and headgear. 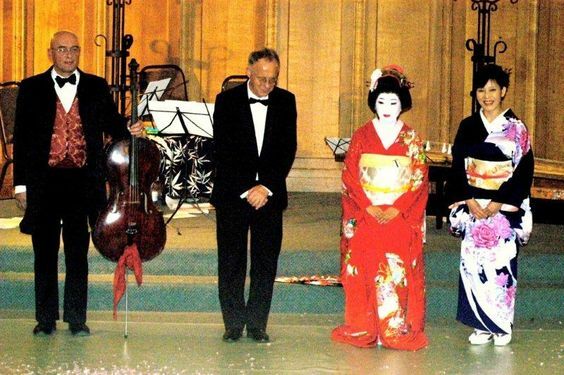 Japanesque is available either as a duo (koto/shakuhachi, or koto/cello); or as a trio. 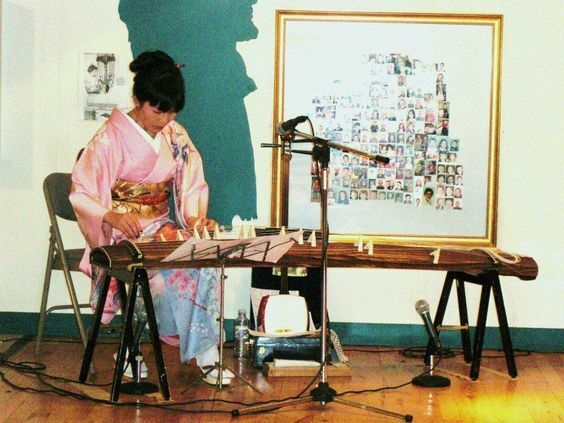 Japanese singer Rié’s father was a professional Japanese singer, and Rié has studied the koto since the age of eight. Since settling in London she has performed and given masterclasses all over Europe, including the Royal Albert Hall and St John’s Smith Square. Clive is a musician and composer specialising in Far Eastern musics. He studied the shakuhachi in Tokyo with Kohachiro Miyata. Recently he has played live on Radio Three’s Late Junction, and worked with Karl Jenkins, Jah Wobble, Complicite Theatre, the BBC Singers, and the BBC Symphony Orchestra. Clive’s solo shakuhachi CD was reissued on the ARC label in 2005. He writes for The Wire magazine. Stuart was a member of seminal electronics group Gentle Fire, touring internationally and working with John Cage and Karlheinz Stockhausen. He now composes and teaches at the London College Of Communication. The Japanese instruments include the koto which is a harp-like instrument whose history spans twelve centuries. The wooden body has moveable bridges to facilitate tuning. The strings (of silk, or nowadays Teflon) are plucked with plectrums worn on the right hand. Also the shamisen, a Japanese lute which has a box-shaped wooden body covered with skin, a long fretless neck, and three strings struck with a large plectrum. 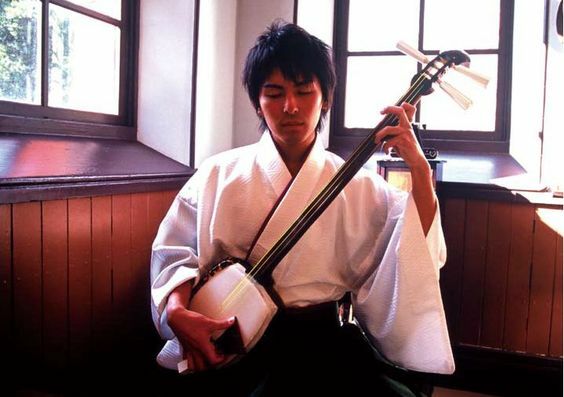 Traditionally the shamisen is used to accompany singing or theatre. Finally the shakuhachi, this is the haunting, five-holed bamboo flute, still used today by Buddhist Zen monks as a meditation tool. Also popular in the past with samurai warriors, its eerie sound is heard in both folk and classical music. Japanesque will need a minimum space of 2m x 1.30m, ideally 2.5m x 1.50m to perform. Koto the Japanese harp itself is 6 feet long plus space is needed for chair and music stand. 2 x 45 minutes sets or the performances can be adapted according to the client’s requirements. Rie was received very well indeed. Please pass on our huge thanks to her and her wonderful performance! Although this was set as background music, I certainly saw the guests looking at the performance in fascination. Our CEO also looked pleased to have a great flavour of Japan at the event. The drummer was amazing thank you!! She made a really great opening to the show, so thank you! The performers were all great and were exactly right. They were all fantastic to work with, on time and were lovely people! Please thank all of them and especially to Nathan for going the extra bit with the rest of his band. I really like them and will look at using him and the band again. I am writing to convey my appreciation for the Tokyo Day events that were staged over the weekend of 30-31st January, 2010, at the Queen Elizabeth II Conference Centre in London. 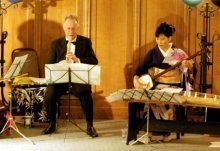 A special mention must go to the rendition of traditional Japanese music by Ms Rié Yanagisawa; she played and sang beautifully, as did Clive Bell, who accompanied her on the flute. I enjoyed this live performance so much that I am going to buy the CD Kurokami. So, THANK YOU again to all those involved in creating this magical weekend experience. Please be so kind as to keep me informed regarding any further such Japanese exhibitions due to be held in London.